Ruby and her grandmother Babushka are off to Paris for a holiday! When they arrive they go and meet Babushka’s brother, Monsieur Gaspar Galushka, who loves hats as much as Ruby loves red shoes. And with Monsieur is his grandson, Felix, who becomes Ruby’s guide while she is in Paris. Ruby first captivated us in Ruby Red Shoes in which we were introduced to her and her grandmother, Babushka Galina Galushka, and their sweet world of gardening, caring for chickens and enjoying a cosy, charming life. 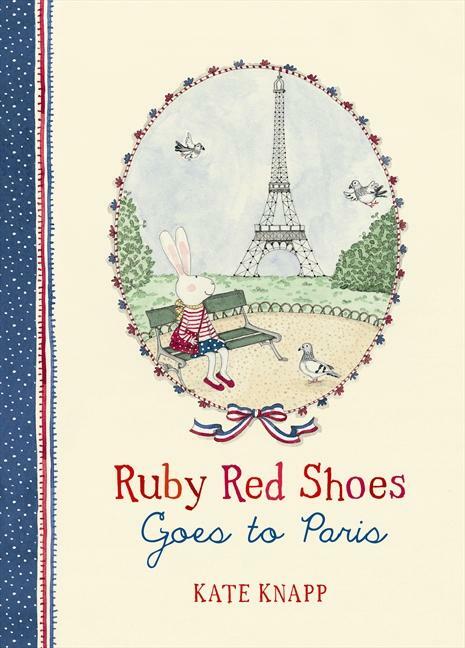 Now the white hare and her grandmother are holidaying in Paris and Ruby is “fizzing with excitement” as they experience a quintessential France. She enjoys the company of French relatives and remembers her friends back home sending them postcards. The writing is enchantingly descriptive and newly established readers can take cues from the gorgeous pictures but the books are also a perfect read aloud with many delightful details in the illustrations to linger over with a younger audience. The book is beautifully produced with thick creamy pages and lovely colours that make it something to treasure. I hope Ruby will be back with a new story soon, I have a feeling she will be.